Sell to Us Price: $155.20 each. 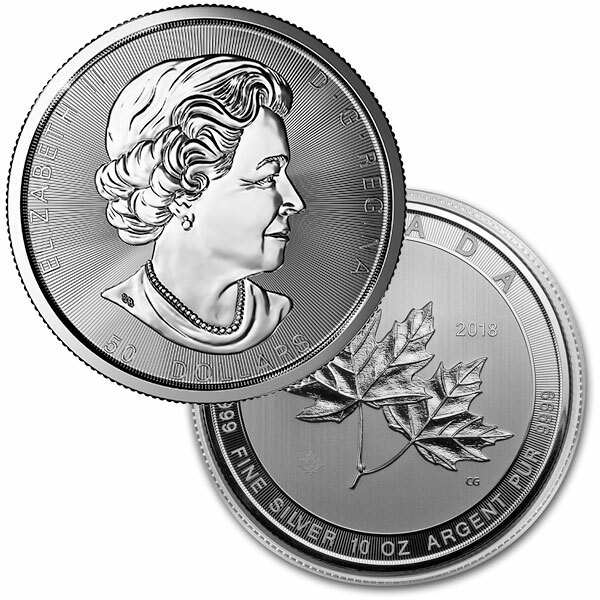 Money Metals Exchange offers beautiful Canadian Silver Maple Leaf coins at low prices. The Canadian Maple Leaf, one of the world's most popular bullion coins is now available in a striking 10 oz silver bullion coin. This coin has been dubbed the "Magnificent Maple". You are welcome to buy in any quantity. Full mint boxes include 24 of these monster sized coins. 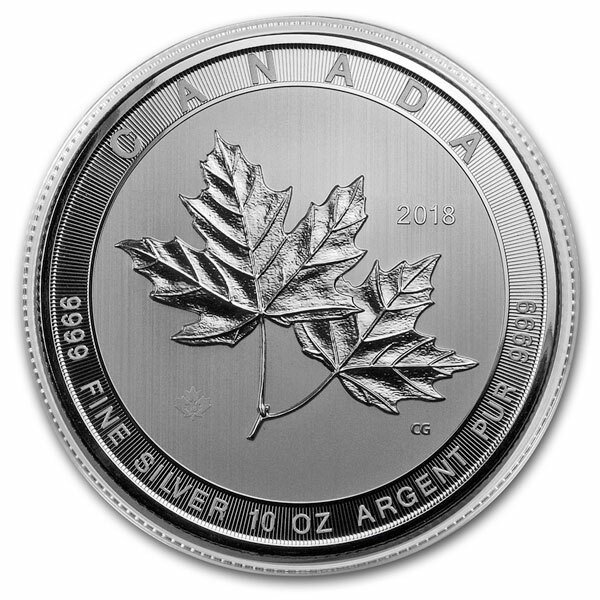 As is the case with other RCM bullion coins, the purity of the Silver Maple Leaf is .9999. Furthermore, the face value of the Silver Maple Leaf is fifty Canadian dollars. This combined with Money Metals Exchange's great prices allow any investor to buy low premium Canadian coins and add international silver of legal tender to their portfolios. 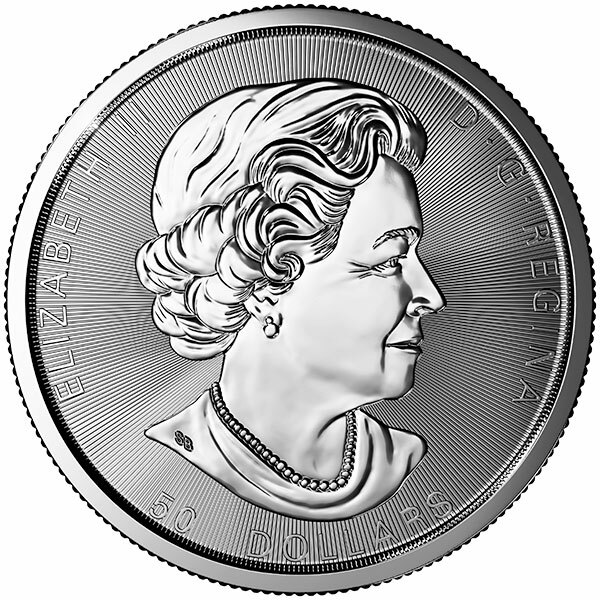 Elizabeth II (obverse) - The obverse of the Silver Maple Leaf contains the effigy of Queen Elizabeth II. Maple Leaf (reverse) - The national emblem, the maple leaf, adorns the Canadian coin's reverse. A small privy mark adorns the lower half of the coin, a special security feature used in the minting process. The design is extremely detailed throughout, including the texture and veins within the leaf itself. The Canadian Silver Maple Leaf coins have been minted annually by the prestigious Royal Canadian Mint (RCM) since 1988. It is undoubtedly one of the most beautiful designs in silver coins' history. The year of issue and the face value of fifty dollars are also displayed on this side. 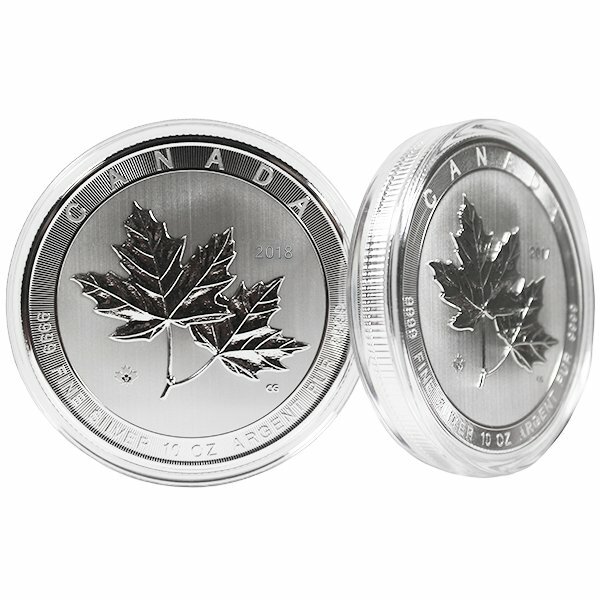 If you are thinking about investing in Canadian silver coins, the Canadian Silver "Magnificent" Maple Leaves are the way to go. Besides 10 oz Magnigicent Maple Leaves, we offer smaller 1 oz Silver Maples. Along with that, we offer the Canadian Gold Maple Leaf in a varety of sizes and these mint gold coins, are unlike any other pure gold bullion coin you will come across. So whether you want Canadian Gold Maples or Silver Maple Leaf coins, we have got you covered. Our current buy pricing is $155.20 each and we will buy up to 100 ounces at this price. Simply call us on any weekday to lock pricing at 1-800-800-1865. Great coin in larger size. Plan to purchase more in the near future. Arrives in capsule for protection and in mint condition. Purchase process easy with quick delivery. BZ to MMX. Great addition to a collection. Also a great bullion investment although I'll find it difficult to part with. I just got this the other day and now I find out that there is a kilo Maple leaf. No matter how much you have they always surprise you with something new. Ughh I guess there are worse things to be addicted to. This 10 oz size is perfect for storage for those like me who are just beginning to invest. However this coin is also incredibly beautiful and easy to convert to cash if needed. Definitely a great option for an investment that looks like a collectible. Ordered one 10oz Maple to "take a look". A real beauty. Just placed an order for 7 more 10oz Maples, (would buy a monster box, with 24, if I could). For a relatively small premium over a 10oz bar, or even rounds-- you get a spectacular sovereign State backed $50 face value coin, with mint markings that are intricate, beautiful and would be almost impossible to duplicate. Have to believe these would be easy to resell anywhere. I would not buy a silver 10oz bar when I can get a 10oz Maple at the MMX price/premium. Checked a couple other vendors and no one else seemed to have these in stock, (believe the 2017 is the 1st year, but also found no '18s for sale either) . Get Them While You Can--- from MMX. This 10 oz silver round is beautiful, it's also a good way to accumulate a large amount of. 9999 fine silver quickly. I love it. I've purchased many silver coins and rounds from Money Metals Exchange and they definitely out do the competition. I'll never buy from anyone else. You can now sell your Canadian Maple Leaf, 10 Troy Ozs. Silver, .9999 Pure back to us online, at a price of $155.20 each!